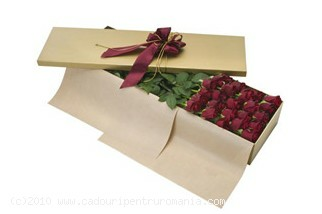 Send this gorgeous box of red roses to that special someone in Romania! The box contains 31 long stem red roses. 1. About the flowers available for delivery in our online flower shop: Send Gifts To Romania offers you a wide variety of flowers available for flower delivery to Romania: roses, tulips, carnations, lilies and anthuryums. We have a local flower shop in Romania, so that all gifts containing flowers are delivered fresh. 2. Types of flowers available for delivery in Romania: roses, tulips, carnations, lilies, anthuryums. All flower deliveries to Romania are completed at the highest standards by Send Gifts To Romania. 4. Scheduling a flower delivery to Romania with Send Gifts To Romania: All flower deliveries need to be scheduled 48 hours in advance. For example, if you would like to schedule a flower delivery to Romania on a Thursday, the order need to be placed on our online gift store Tuesday before 2.00 pm the latest.